How advances in science are made, and how they may come to benefit mankind at large are complex issues. The discoveries that most influence the way we think about nature seldom can be anticipated, and frequently the applications for new technologies developed to probe a specific characteristic of nature are also seldom clear, even to the inventors of these technologies. One thing is most clear: seldom are such advances made by individuals alone. Rather, they result from the progress of the scientific community; asking questions, developing new technologies to answer those questions, and sharing their results and their ideas with others. However, there are indeed research strategies that can substantially increase the probability of one’s making a discovery, and the speaker will illustrate some of these strategies in the context of a number of well known discoveries, including the work he did as a graduate student, for which he shared the Nobel Prize for Physics in 1996. This is a very popular lecture. In it he describes how a number of discoveries were made, and how a few new technologies were developed and why. He spends quite a bit of time describing the development of NMR, as a specific example of how important new technologies often come from the world of basic research, and the developers of these technologies often haven’t a clue as to what the ultimate value of their development will be. 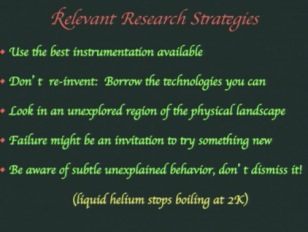 He also talks about his discovery of superfluid 3He, as he knows more about that discovery than any of the others.